In the piercing cold days of late February, I walked the length of Mission Street, up the east side and down the west side, from south to north, from Cesar Chavez Street to Duboce Street. I stopped at the “That’s It” bodega at Mission and 23rd streets, where the sign says “The Center of The Miracle Mile.” The “Miracle Mile” was the moniker given to Mission Street during its ascendance, from the 1920s to the 1960s, as the second most important commercial drag of the city. Here I saluted a past immigrant era, when Irish, Italian, Scandinavian, German, Russian and other immigrant workers of European origin living in the neighborhood went bargain hunting on Mission Street. New Mission Theater on Mission Street, between 22nd and 21st streets, Feb. 7, 2018. After World War II, upwardly mobile European workers moved out with the opportunity to buy property in the suburbs with low-cost mortgages available to veterans under the G.I. Bill. In the wake of their exodus, the Latino working class—traditional inhabitants of the old “Latin Quarter” of North Beach—increasingly moved into the vacated cheaper rundown residences of the Mission. Through each rotating generation of workers, stores adapted their wares to the dominant ethnic preferences. By the 1960s, the signs on Mission Street started displaying Spanish to meet up with the growing working population of Latin American origin. Grocery stores, hair stylists and barbers, butchers and fishmongers, money senders and check cashiers, shoe and clothes shops, movie houses, dentists, doctors, accountants and lawyers, travel agencies, thrift stores, jewelers, photography studios, pawn shops and nonprofit agencies have been serving the servants of the City by the Bay for over one hundred years on Mission Street. That was it! Until now. I walked on Mission Street three more times, both ways, tallying the number of store fronts that are closed, the number of store fronts that are now upscale pubs, bars and restaurants, and the number of sites under construction slated to be future condos and new posh storefronts that serve wealthy tech workers with expensive taste and money to waste. I got curious and walked again, scouting for what remains of hotels, mixed residential rental units and family serving businesses on the cheap. I return with a warning: Speculators are preparing a final assault on the last vital spaces and services for the working poor on Mission Street. Vacant lot at Mission and 22nd streets next to the Vida Condos, where a mixed residential and commercial building once stood before it burnt down, Feb. 7, 2018. On the morning of Oct. 14, 2013 I felt compelled to go to 22nd and Bartlett. The news said that a man had been killed at 4:30 a.m. earlier that day in the alley. Turning the corner on Bartlett with a flaming sage wand, I approached the place at 22nd Street where the man had died. Gently I sought the signs of sudden altar-making: love letters to the fallen, spent candles, bottles emptied to wash out the grief. A black SUV was parked in the middle of the alley. I asked the two homies there, “Was he your friend?” They both nodded, raising their chins, pulling at their cigarettes. I rounded their SUV with the smoking sage. They pointed to the place where Maurice White had died. I got on my knees and blessed Maurice, his friends, his family, the street, the air above this spot, the place beneath my knees. The sage wand was burning hard now and I laid it down in proximity to the first altar items scattered on the sidewalk. When Maurice died, the construction of the Vida condos between Bartlett and Mission streets, formerly the location of Giant Value, was already underway. The iconic signage in big bold block red letters that had once marked the place where families counting pennies could find cheap household and personal items, was gone. Vida, life. I remember when they were marketing these condos for sale. On Mission Street, the realtors created a storefront with flashy TV screens depicting an idyllic spectacle of life in the Latino Mission—Carnaval, brown happy families, lowriders, ebullient foot traffic—with a promise to the buyers that they would come to live here, in the heart of the Mission. The entire speculator storefront felt like a cruel art installation dedicated to selling out the Latino working class to tech gentrifiers. By summer 2015, the units had sold at prices ranging from $644,000 to $1.865 million with 90 percent of the buyers employed in the tech industry. Vida condo owners now complain and demand that the annual judging stage across from their building for Carnaval—a 40-year-old community event—be removed from its location. Developers built the Vida Condos on the promise of developing senior affordable housing on Shotwell Street near Cesar Chavez Street, but ground was only just broken this year (too late for those displaced in the four years since the Vida condos were built and these units were not). 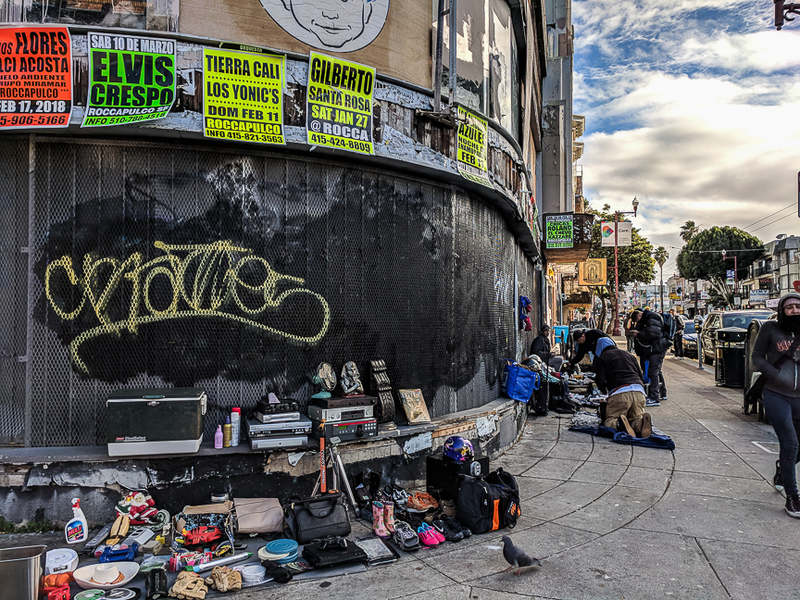 When I look up at Vida, I wonder if the new land owners will ever settle down long enough to experience the grief of loss of a neighbor on Mission Street, or will they move on, oblivious to the damage created by the speculators who brought them here. In January 2015, a four-alarm fire at the large three-story mixed commercial and rent-controlled residential building that occupied the corner of 22nd and Mission streets broke out, right next to Vida, killing one person and displacing more than 40. 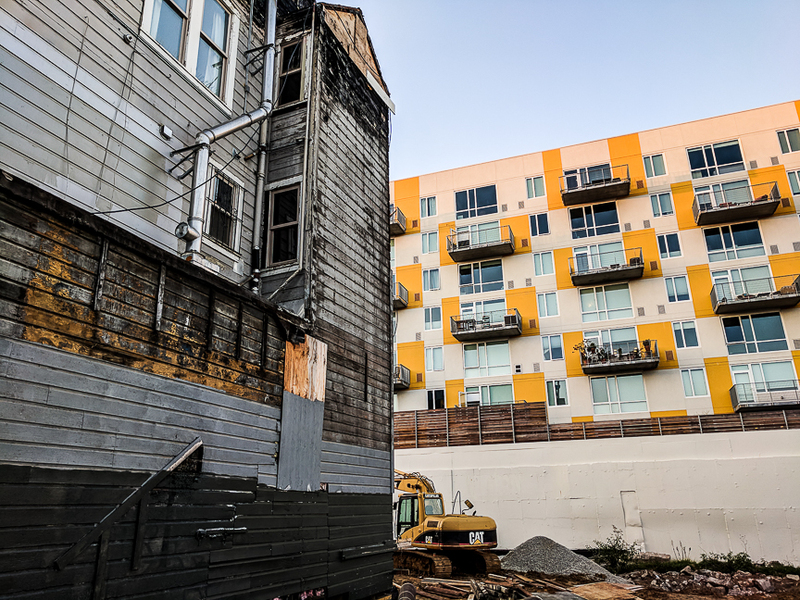 A grand jury on the Mission fires concluded that the slumlord conditions had breached all fire codes and their lack of enforcement led to the demise of the building. The building was in a prime real estate location. The historic Mission Marketplace on the bottom floor that catered to low-income ethnic preferences was obliterated. 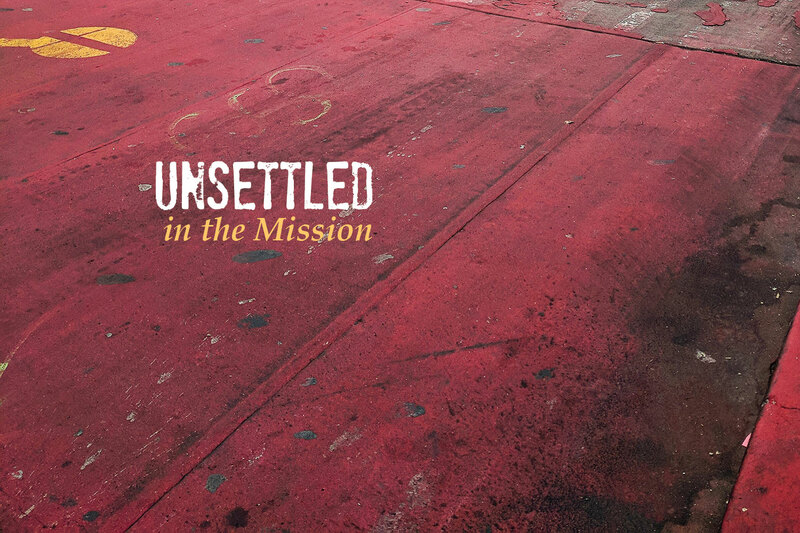 The displaced families are still waiting to learn whether they will ever find a home on Mission Street again. The controversial red bus lane on Mission Street near Cesar Chavez Street, Feb. 21, 2018. In those cold February days, I visited Peter Papadopoulos and Christopher Gil at the Mission Economic Development Agency (MEDA), a nonprofit organization that has been promoting economic equity and social justice in the Mission District for 45 years. We sit and compare notes on Mission Street. My research using a realtor weapon, the Property Shark website, shows that the selling prices of single home dwellings and condominiums are the driving force of gentrification, which this year have already, respectively, hit an alarming $1,992 and $1,092 per square foot median selling price. Harder to flip and to sell but following the same trend, the mixed residential and commercial units have a median selling price from $500 to $548 per square foot. Checking on Property Shark, I have also noted that the closed commercial storefronts seen on Mission Street have already changed hands several times in recent years, between trusts and LLCs set up by real estate speculators and owners to prepare their land assault. MEDA is working with incoming merchants on Mission Street on meeting community standards, working towards legislation that slows down the take-over by promoting family values, and buying properties such as the derelict building at 18th and Mission streets, the soon to be new home of Dance Mission and Mission Neighborhood Center offices. The intent is to anchor the corners of Mission Street to allow for cultural place keeping. MEDA also collaborates with the City’s Small Sites Program to purchase low-income residential properties that may otherwise be bought to be flipped. Still, MEDA can only buy what is for sale and feasible to buy. Without another community uprising demanding a more decisive stance by politicians in City Hall, there will be a wholesale sell out of the Mission District, a historic Latino, multicultural, working-class safe haven. The uprising is in the works. The red transit-only lane on Mission Street from 14th to 30th Streets was concluded in May 2016 by the San Francisco Municipal Transit Agency (SFMTA). The focus of the red bus lane was narrow: move buses and the people on them faster. But the plan didn’t go over well in the community, because the Mission is a magical place with a long memory. In 1966, the Mission was a derelict neighborhood. Along came the federal Model Cities program that promised local government support for “redevelopment” and “urban renewal” of poor and working-class communities in the City. It was said to be for the good of the people. But the Misioneros who had jammed in the Fillmore (the Harlem of the West) had seen first-hand the effects of federal money on the Western Addition that resulted in mass dislocation of the Black community and the squashing of its vibrant culture. When that year, City Planners came around with a feasibility study for BART construction, the people of the Mission, from business owners to union leaders to radical organizers resisted. It was a querulous year of organizing, in which the high diversity of groups sorted themselves out into a single issue organization, the Mission Council on Redevelopment (MCOR), whose purpose was to stop the imposition of redevelopment in the Mission. The MCOR gathered tenant’s associations and poor renters, churches of diverse denominations, powerful labor unions, business and property organizations. One of the guiding questions of the MCOR was “Where am I in this picture?” The MCOR raised such successful community opposition that the redevelopment was blocked by the Board of Supervisors. After its success, the MCOR disbanded, but a number of people continued the mobilization it began and formed the Mission Coalition Organization (MCO), now with the purpose of creating a representative organization that would seek absolute control of redevelopment funds in the Mission. The MCO revealed a rich tapestry of people in its decision-making structure and came to involve 12,000 residents from the neighborhood population of 70,000. This level of urban mobilization in San Francisco hasn’t been equaled since. Historic building on the corner of Mission and 18th streets, purchased by MEDA, that will be refurbished for cultural and social community uses, Feb. 22, 2018. The MCO, which became the conduit for then Mayor Joseph Alioto to manage the federal “Model Cities” money, eventually collapsed in the 1970s, but not before defining key development projects according to Mission residents’ concerns. Perhaps most importantly, the MCO made the Spanish-speaking constituency of the Mission undeniably visible. Through internal pulls and tugs, and even in its fragmentation, the MCO strengthened existing organizations and seeded a variety of new community organizations. Among the nonprofit organizations founded prior to and during that period, the Centro Social Obrero, Arriba Juntos, Real Alternatives Program (RAP), Horizons Unlimited, La Raza Centro Legal, the Mission Cultural Center for Latino Arts (MCCLA), Precita Eyes Muralists, MEDA, Acción Latina, and the San Francisco Tenants Union, remain in the service of Mission families. With even older organizations founded at the start of 20th century, such as the Mission Neighborhood Center and other faith-based organizations, Mission organizers went on to nurture more iconic safe spaces like the Instituto Familiar de la Raza, La Galeria de la Raza, Brava Theatre, H.O.M.E.Y., Causa Justa, and CARECEN. Casa Guadalupe at Mission and 26th streets, Feb. 21, 2018. Realtors and YIMBYS and politicians appear wide-eyed and confused at the Mission Latinos’ capacity to demand control of development, but the historic pulse of La Raza does not ask for a seat at the colonizer table, it sets its own goddamn table with chilaquiles, pupusas and agua fresca, grandmother and grandchildren in a jumble holding down the corners. 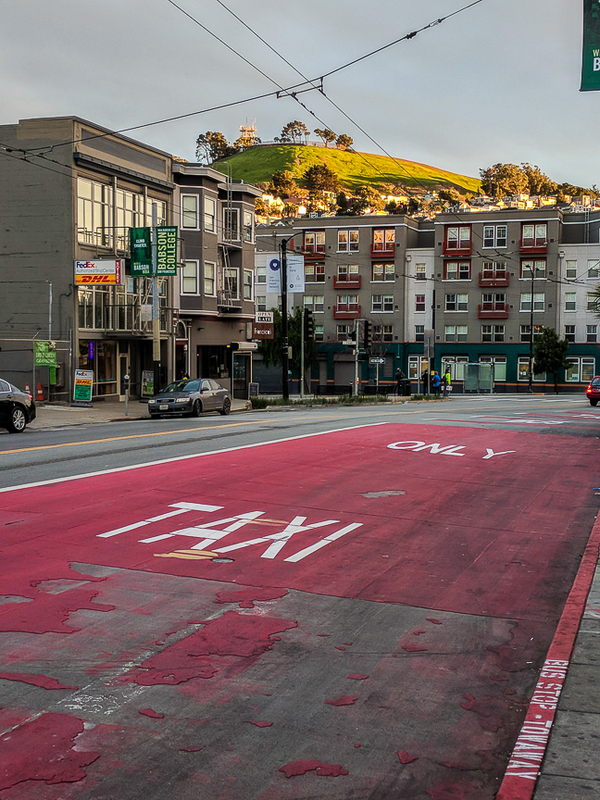 The red bus lane on Mission Street operates on three basic principles to minimize car cruising: forced right turns for cars every few blocks in the northbound direction, no left turns, and a forced right turn on Cesar Chavez street. 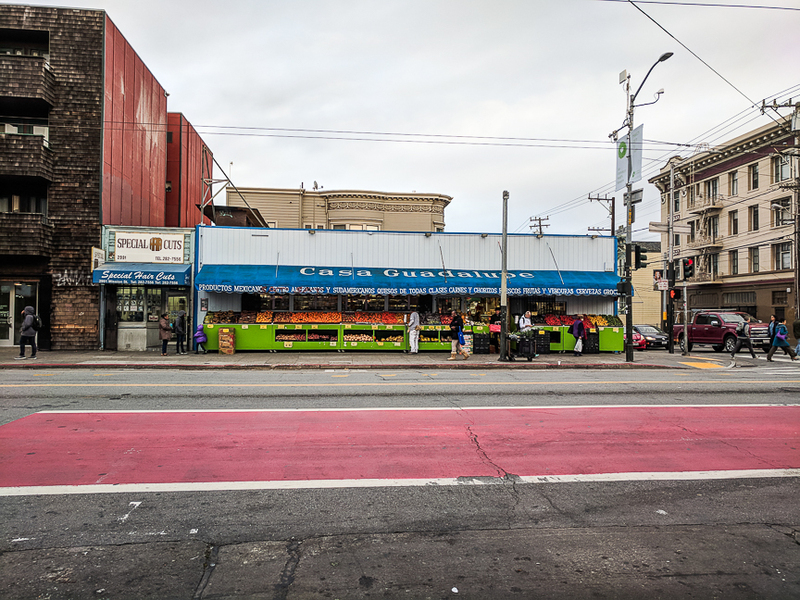 The results of the red lane are that Muni buses now move 2 minutes faster, and the daytime Latino family-serving businesses on Mission Street are suffering dramatically from the diminished ability of customers to arrive at and park near these stores. Meanwhile nighttime pubs, bars and restaurants catering to wealthy tech workers and tourists are opening in increasing numbers. 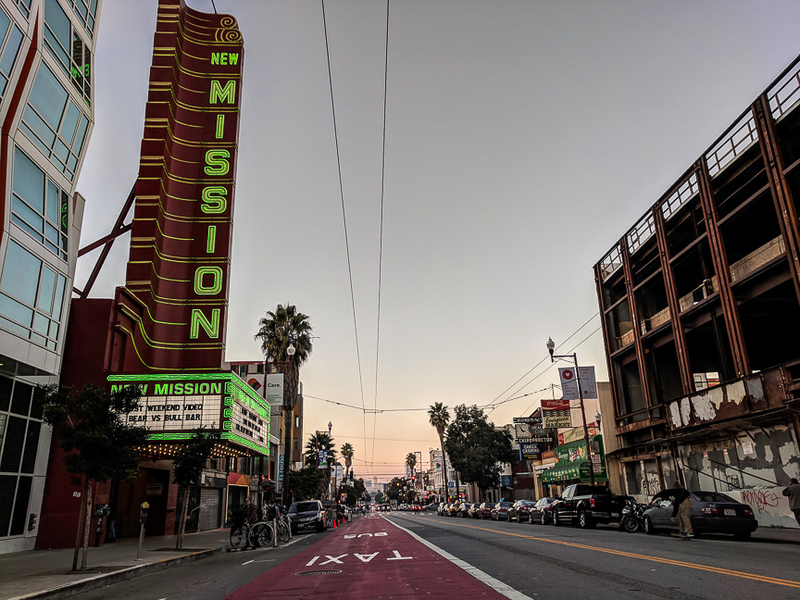 The rising booziness of Mission Street is a slap in the face to Mission organizers who worked hard through the 1980s and 1990s to create the most restrictive liquor laws in the city. Their work served to reduce access and exposure of youth to liquor abuse and support ongoing recovery programs. Adding insult to injury, the red bus lane rules make lowriding on Mission Street all but impossible. In the peak years of 1979 and 1980, Fridays and Saturdays saw a line of low and slow red taillights facing off against the oncoming bumpity-bump string of headlights, as Latino youth spilled out into the streets, from Silver Avenue to 14th Street. Mission Street became the lowriding mecca of Northern California with regular clashes with police, who used the neighborhood as their rookie training grounds to crack brown and black skulls. The Mission lowriders fought and won a legal battle against police to end their racial discrimination and uphold their right to self-expression. The sudden prohibition to cruise in a handcrafted wheeled artwork is alone a hair-pulling outcome of the red bus lane. 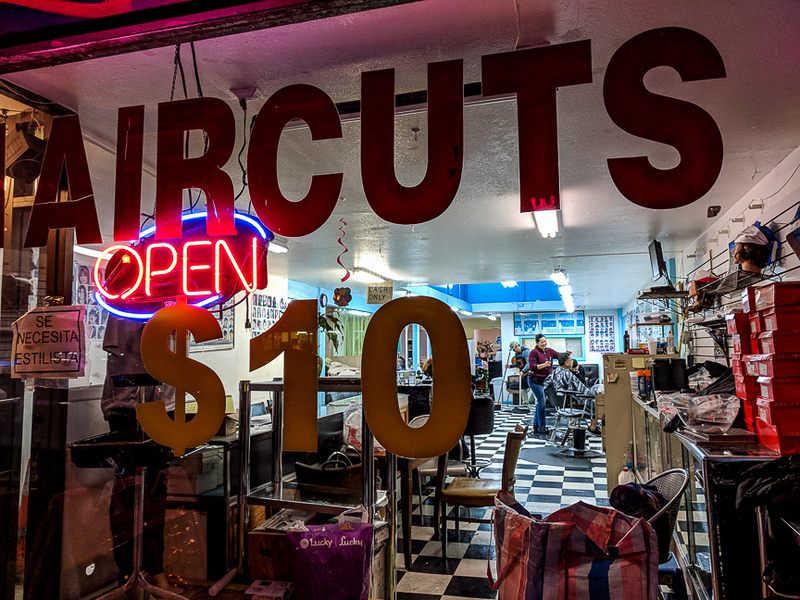 Peluquería y tienda sobre Mission Street, ofreciendo cortes a costo accessible de $10, 22 de febrero de 2018. At Revolution Café, near Mission and 22nd streets, next to the crater of the burnt down unit, on a Monday night in late February I had a drink with Chicana feminist intellectuals: master artist Yolanda Lopez, and Angelica Rodriguez, the Gallery Director at the Mission Cultural Center for Latino Arts. The MCCLA—a 41 year old institution—is down the road at 25th and Mission street. We were discussing Guillermo Del Toro’s “The Shape of Water,” which we had just watched around the corner at the refurbished New Mission Theater next to Vida. 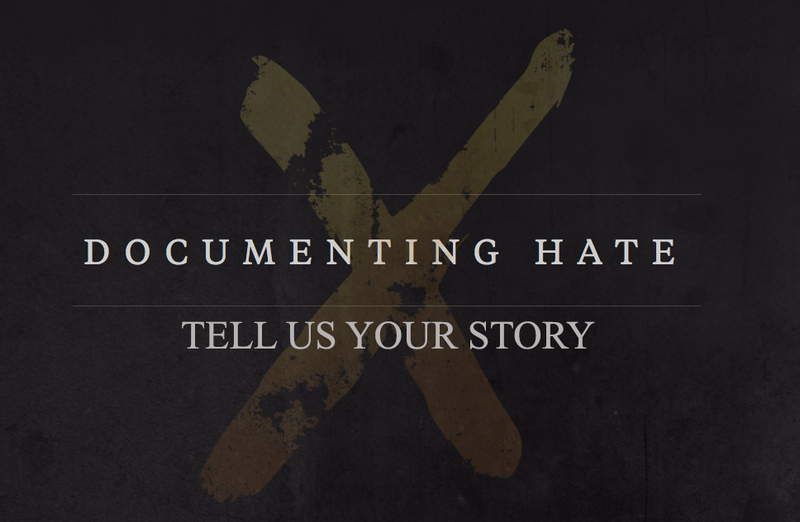 The movie is about others and the monsters who persecute them. It gave us cause for reflection. I became friends with Yolanda and Angelica about four years ago, when I asked to shoot a cameo of Yolanda for a storytelling series I had filmed around a campfire. At the campfire, traditional Mission residents told their stories of eviction: teachers, social workers, activists, and artists, like Yolanda’s son Rio. At the time, Yolanda, Rio, his father Rene Yañez and Rene’s partner Kiki Wallace, were facing an Ellis Act Eviction from their San José Avenue apartment complex. During the shoot, Yolanda and I—complete strangers to each other, she a world-class artist, me just laughably lucky—decided to collaborate on an exhibit at the Sólo Mujeres annual show at the MCCLA. “I want to use my eviction papers,” said Yolanda. Our application was accepted. Angie was the gallery boss. Our installation, titled “Eviction Scene Investigation,” incorporated a murder board that featured a serial evictor and his victims. The day before the opening, Yolanda sat in the gallery, sketching a portrait of our main suspect, serial evictor Sergio Iantorno, and his victims including Yolanda and her son. She was determined to expose the culprit, but cried quietly when drawing her son. Observing the grief and stress levels experienced by so many longtime residents of the neighborhood, it is clear that eviction by gentrification kills. Yolanda was certain she would end up homeless. 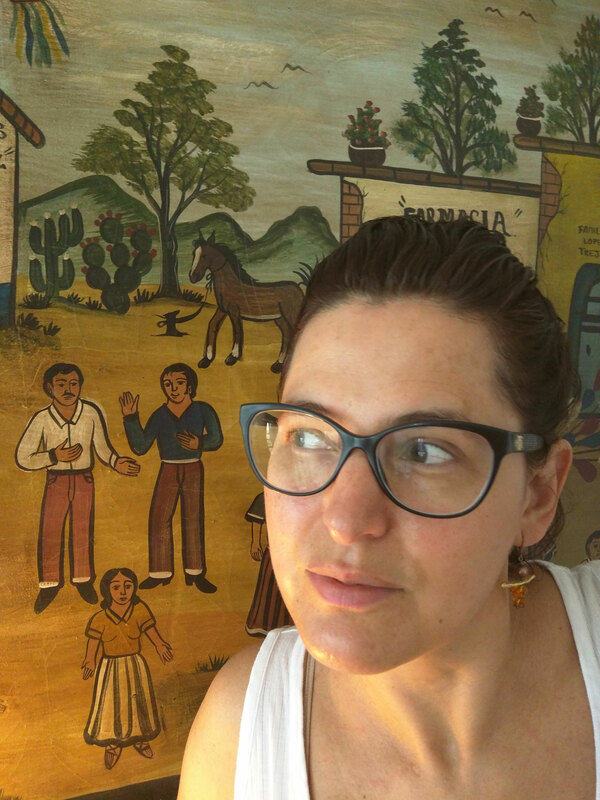 MEDA saved the day by buying the building a few months later, allowing Lopez to live in a now refurbished, permanently cheap rental unit, until the day she dies. 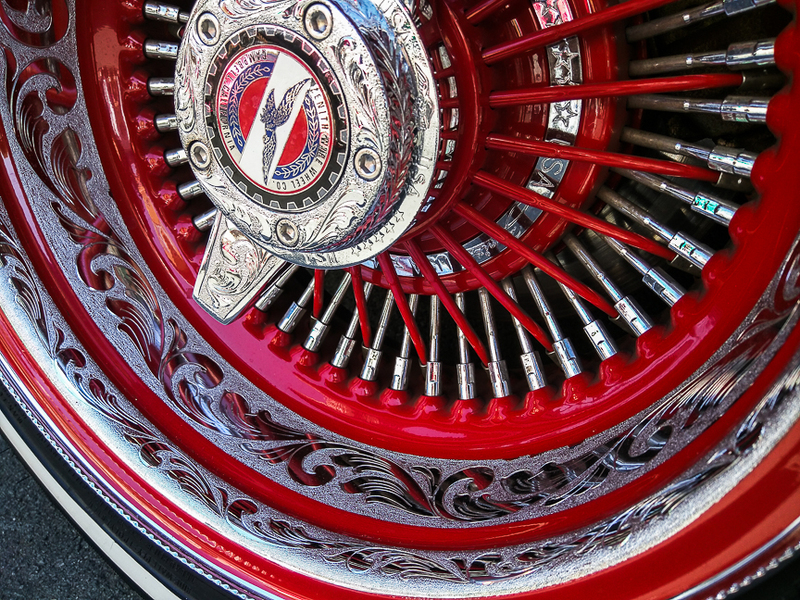 Rim on a red lowrider, 24th Street, Sept. 17, 2017. Leaving MEDA in the late afternoon, I continue my work of tallying up closed storefronts and new hipster bars on Mission Street, when Carlos Gutierrez, co-founder of H.O.M.E.Y., an organization empowering at-risk youth, appeared before me. He had stepped out for a moment from H.O.M.E.Y., which has had a miraculous return to Mission Street with the support of MEDA. I accompany him on a bank errand, and then we have a spontaneous cafecito at La Taza. Carlos regales me with stories about how Mission Street used to be in the early ‘90s—the bombed-out buildings with corners filling to the brim with homies. Many of them faced the same struggles he did: teaching each other how to sell drugs to survive; losing dozens of friends and acquaintances to street violence and drugs; rising to the occasion of being a teenage father; accepting the help of social workers in the Mission who had his back when he took a decision to change his path; making his crew of homies proud the day he gathered them, not for a funeral or a welcome home from prison party, but for his graduation from college. Carlos Gutierrez is a hero to me. He once had his ticket out of the hood, but he has returned when hope is low for miracles on Mission Street. The conversation continued, and I brought up “Black Panther” showing down the street at the New Mission Theater. It made me cry to hear a Mission homeboy, who pulled himself up by his bootstraps, say that the Mission is his promised land, because of all the struggles overcome and those still to be faced. Land speculators, these two-faced carpetbaggers on Mission Street, will continue to use the cultural character of the neighborhood to flip storefronts and residences. But this is Aztlán for the Mission Latinos born and raised here. When they’ve buried their dead here like the Mission homegirls and homeboys have, maybe then can they lay a claim to this land. Until then, developers can expect a street fight. Hark! To arms! Aztlán Calls!